Datashine is an output of the ESRC BODMAS project which ran from 2013-2015 at UCL. Any feedback or questions about the DataShine project, including our first release DataShine: Census? If so, please leave a comment on our Comments page. We read all of them and aim to reply as soon as possible. 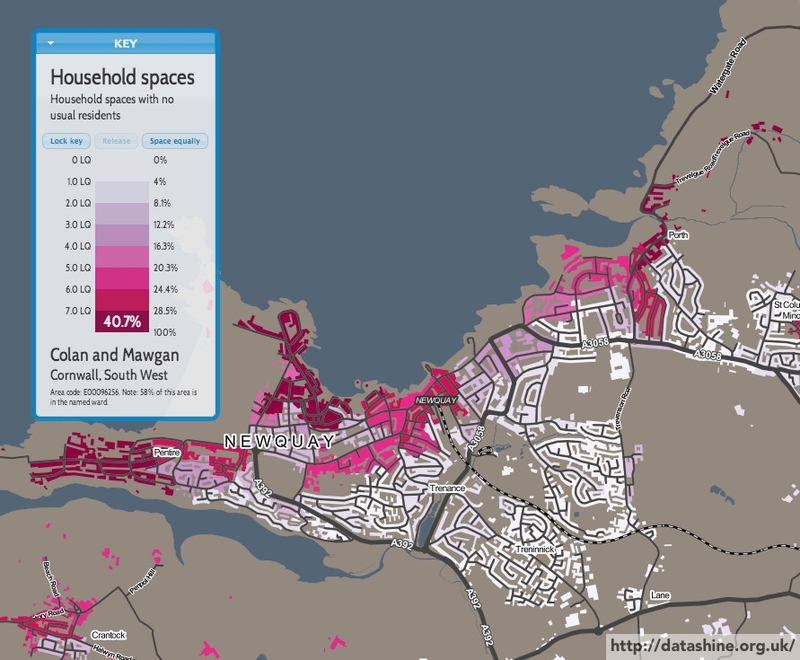 Welcome to the information blog about DataShine, showing examples and tips from the first project, DataShine: Census. If you have any comments, please let us know here, or you can find out more about the project, and the people behind it, here. 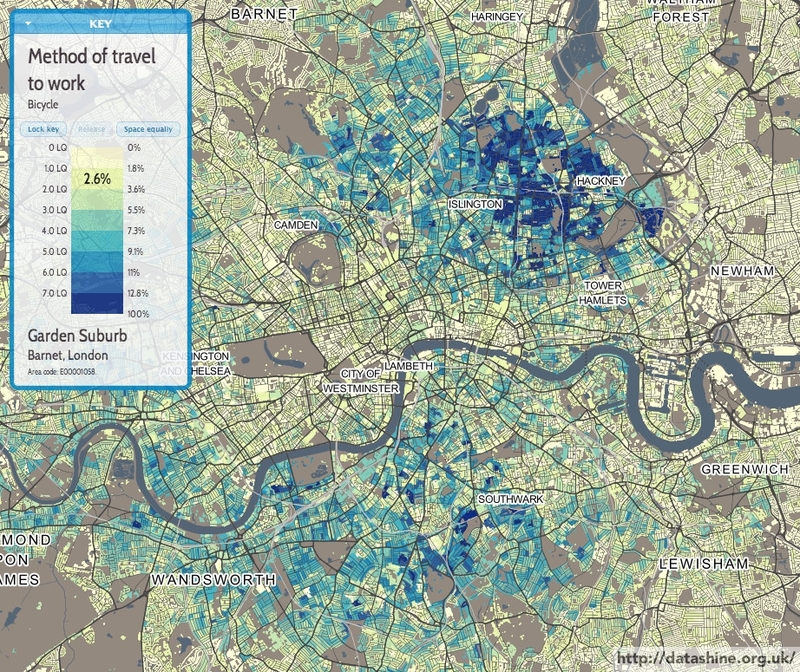 Today, the Office for National Statistics (ONS) have released the Travel to Work Flows based on the 2011 census. 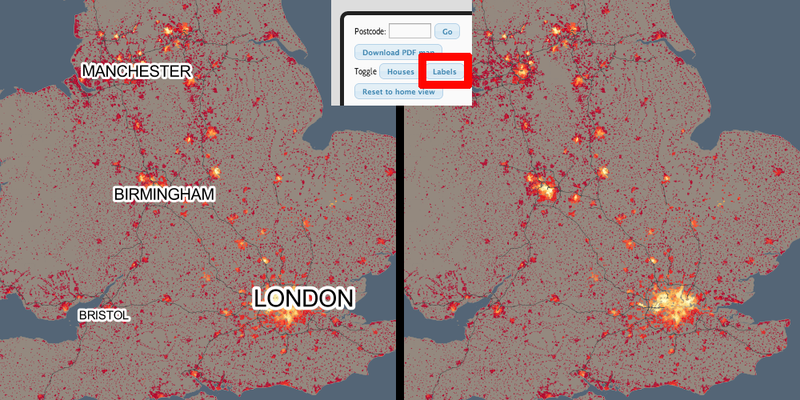 These are a giant origin-destination matrix of where people commute to work. There are various tables that have been released. I’ve chosen the Method of Travel to Work and visualised the flows, for England and Wales, on this interactive map. 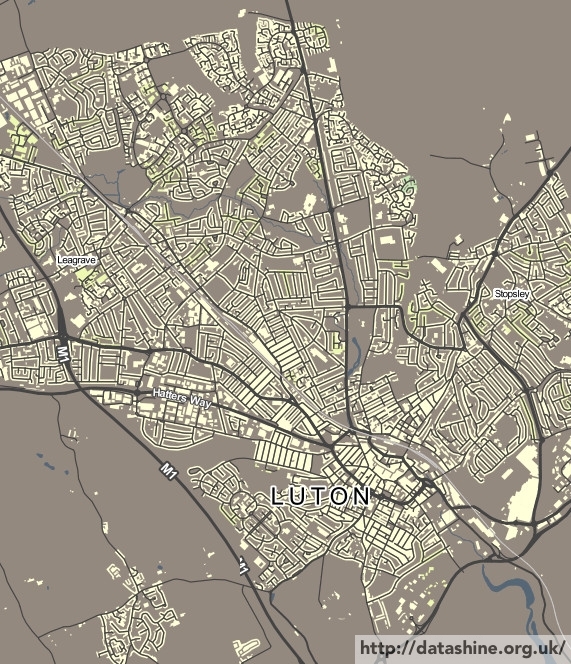 The map uses OpenLayers, with an OpenStreetMap background for context. Because we are showing the flows and places (MSOA population-weighted centroids) as vectors, a reasonably powerful computer with a large screen and a modern web browser is needed to view the map. The latest versions of Firefox, Safari or Chrome should be OK. Your mobile phone will likely not be so happy. Blue lines represent flows coming in to a selected place, that people work in. 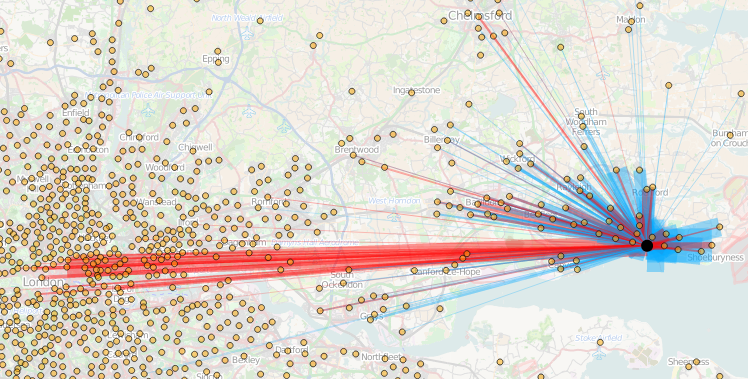 Red lines show flows out from the selected location, to work elsewhere. 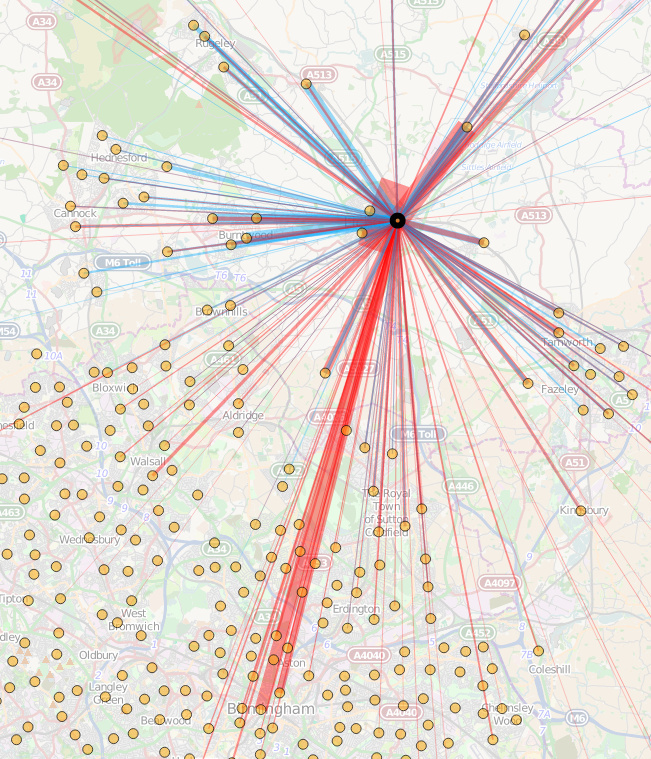 The map is part of the DataShine platform, an output of the BODMAS project led by Dr Cheshire, where we take big, open datasets and analyse them. The data – both the travel to work flows and the population-weighted MSOA centroids – come from from the ONS, table WU03EW. View the interactive map here. The labels that appear on the map add some context, and help you find out where you are, but we realise that sometimes these labels can be less than helpful, and can obscure the data. With this in mind, we have now added a “Labels” button, beside the “Buildings” button, at the bottom. Clicking this will toggle labels off/on. The setting also extends through to the PDF creator functionality. Posted on 21 July 2014 7 August 2014 Author Oliver O'BrienCategories Census, General, TipsLeave a comment on Labels! DataShine has been out for around a week now, and we’ve made some changes to fix small bugs. DataShine should work much better in Internet Explorer 9 now, as we now prompt this browser to use compatibility mode, with which the website displays correctly. When showing a dataset that diverges around the mean, we always switched to the red/green divergent colour set, even if another colour set was specified in the URL. We now keep track of this and other manually specified colour changes, and stop the auto-changing in these cases. We truncate long category names more aggressively now, so that they don’t spill out of the end of the data chooser even in browsers that use larger text for drop-downs. This is a more zoomed-out map, showing how the proportion of people stating they had no religion, varies around the the country. I’m using a ColorBrewer diverging colour ramp “BrBG” which diverges around the average value of around 25%. Turquoise areas show concentrations of large numbers of atheists. Live map here. This map shows the proportion of people that consider themselves to be in very good health, in the Liverpool and Wirral area. 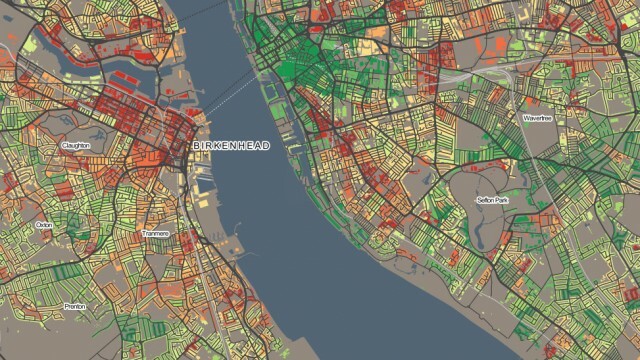 By using a diverging colour scheme, it shows there are stark differences between the two sides of the River Mersey, and within Liverpool itself – even within the city centre area. You can change to your own one by specifying the ColorBrewer ramp code in the appropriate place on the URL of DataShine Census, e.g. &ramp=YlOrRd. Note that if you specify one of six ones at the bottom, then it may still switch to the default sequential or diverging one. But for any of the many others available, this will not happen. The picture here is using the “Spectral” colour ramp. This is a diverging colour ramp, best suited for showing variations on either side of the average, so we are somewhat misusing it here, as here only the darkest red colours represent below-average values. The south-west is known as a place where there are many second homes. In some villages, so many of the homes are empty for much of the year, or are simply holiday homes, that living there can seem even quieter than you would expect. Above is Newquay, the capital of surfing in the south-west and a place that shows a huge variation the proportion of houses “with no usual resident” as you move across the town from east to west. “Prime Central London” is a strange place, where the super-wealthy buy homes but then don’t necessarily live in them. 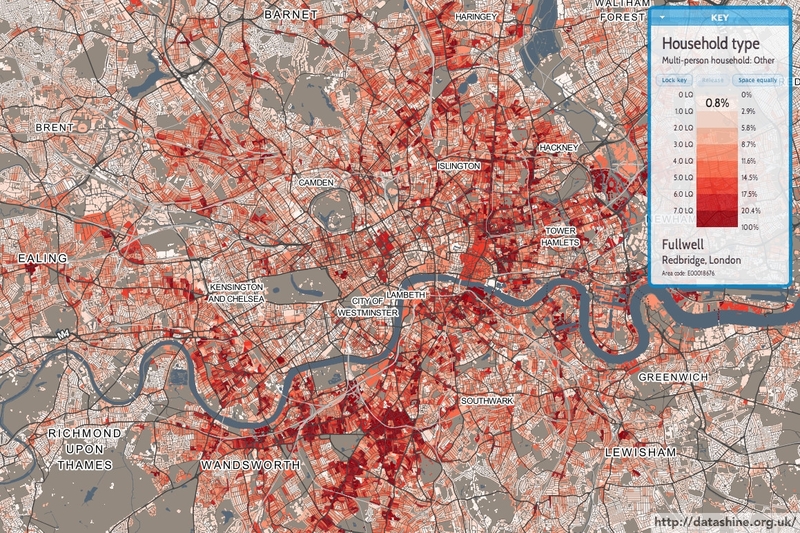 The boundaries of Prime Central London can be seen quite sharply – with the proportion of homes that are often empty falling away quickly as soon as soon as “real London” is encountered. Posted on 16 June 2014 7 August 2014 Author Oliver O'BrienCategories Census, ExamplesTags featured1 Comment on Holiday Homes? Cycling to work is on the increase but is at very low levels in most places in the UK – and there are very wide variations, even across towns and cities of similar size. You can see the cycling map for your local area here. London is a significant destination for many people at various lifestages. One particularly popular inflow is university graduates looking for a place to live as they start their first career-minded job in the capital – coming from the other 100 or so universities in the UK outside London, or from Europe or elsewhere. It is often a rush to find somewhere to live, as it’s hard to get time off to search for houses when starting on a graduate career. London is also a very expensive place if you do not have an established income and have not yet received your first pay cheque! So, many people start in the capital by sharing with friends, fellow interns, or other people in a similar situation. There is a significant geographic clustering in where these people live, and they are quite easy to spot in a couple of Census tables. 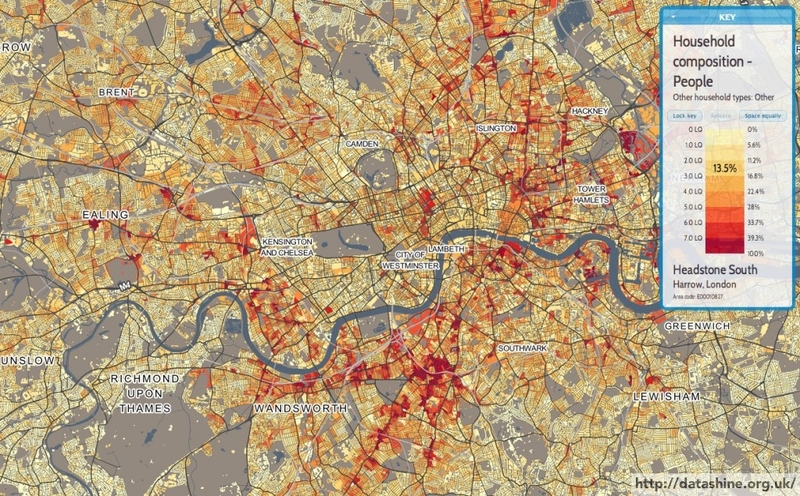 They likely live in places which are not right in the centre of the city (too expensive) but which are well connected to the City and the West End (the major sources of graduate employers) by tube or other transport. Above all, they are likely places with an established nightlife, with bars and clubs, to ease the transition from university life to a professional career, and help people find their feet. 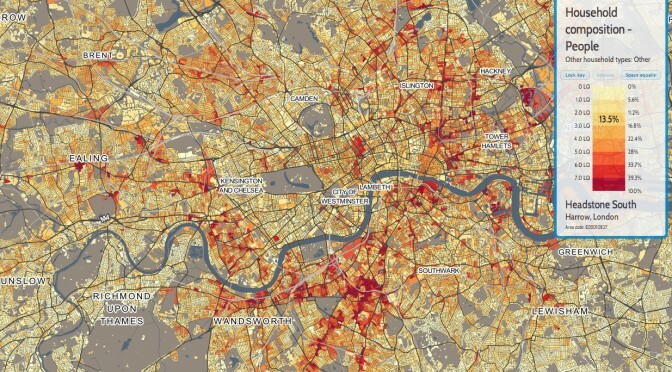 Above is a map showing multi-person households where not all those in the household are students or married/cohabiting. The highest values, where over 20% of households in an area fall into this category, are shown as dark red. 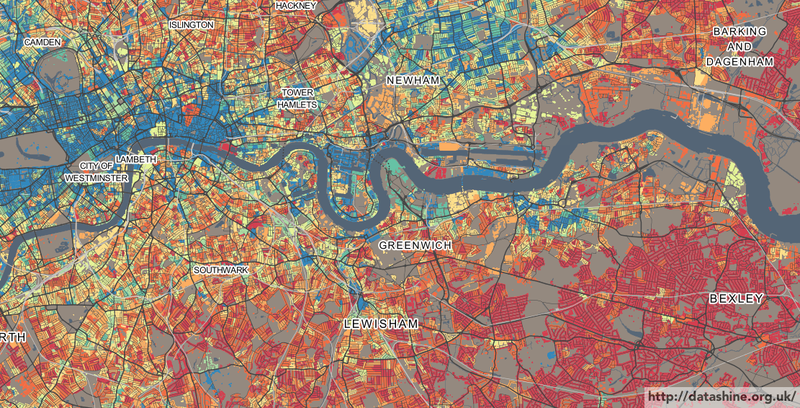 In some places, such as parts of Clapham, Whitechapel and Hackney Wick, the figure is over 40%. 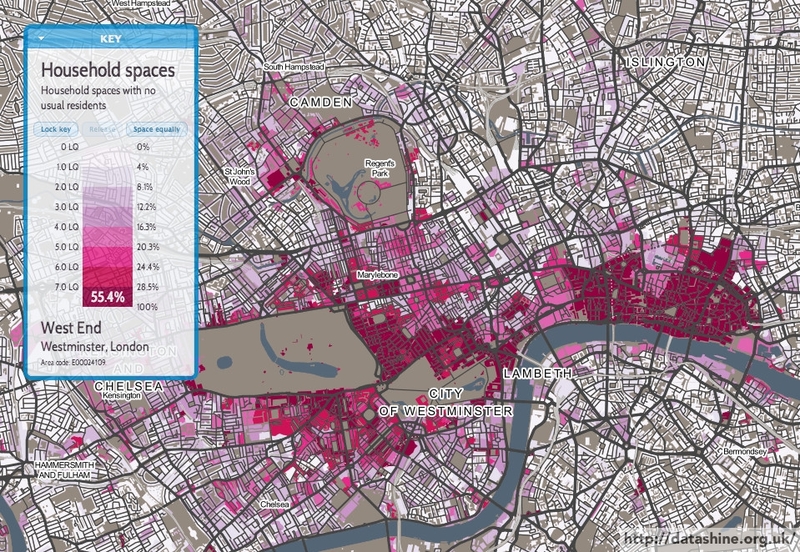 Other popular areas are Fulham, Balham, Shoreditch and Dalston. All places with a high number of bars and a mix of nightlife and residential blocks. By contrast, further out areas – Bromley, Bexley, Enfield, Kew – see very low percentages. There is also a noticeable dip in Kensington & Chelsea – nice and central, but almost all places here are likely far too expensive for the majority of those just starting out in London. You can see an interactive version of the map here. DataShine: Census is the first product of BODMAS’s DataShine toolkit. We have taken the Quick Statistics aggregate tables, released for the 2011 Census by the Office of National Statistics. We are using two geographies for these – Output Areas, which have a typical population of around 150-200 people, and Wards, which, being a political rather than statistical unit, vary more in population but typically have around 7000 in each. Wards have the advantage of having real names rather than numbers, and are manually designed to surround contiguous communities. As you zoom in and out of the DataShine Census maps, you’ll see the geographies change – Wards are simpler (so faster to create the maps) and because of their larger populations, have less of a patchwork look, particularly for datasets that have a very low average value or high variation. The DataShine Census maps are generally maps showing the variation in percentages of a general population that fall into the selected category type. We have removed a small number of different maps in the dataset – such as population density – although hope to have these included in due course. We have also not, at this stage, included the Scottish and Northern Irish datasets, as these come as separate files. Again, we hope to have these in DataShine Census in time. We decide how to map each data table based on the average percentage (for the current geography) and the standard deviation of the percentage values. Many census variables have very small average values (less than 1%) and standard deviations of the percentage and so are mapped as multiples of the average, or location quotient (LQ). 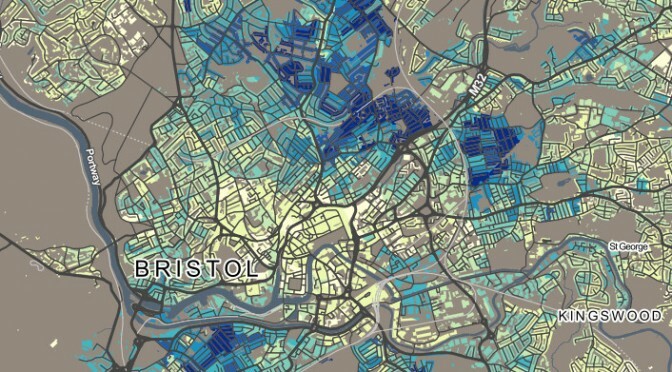 For example, an LQ of 6 indicates the local area has six times the proportion of people (or households) in the selected category, than the England/Wales average for that geography. Other strategies are tried for different kinds of data.